The AP history courses seek to apprentice students to the practice of history by explicitly stressing the development of historical thinking skills while learning historical content. Students best develop historical thinking skills by investigating the past in ways that reflect the discipline of history, most particularly through the exploration and interpretation of a rich array of primary sources and secondary texts and through the regular development of historical argumentation in writing. 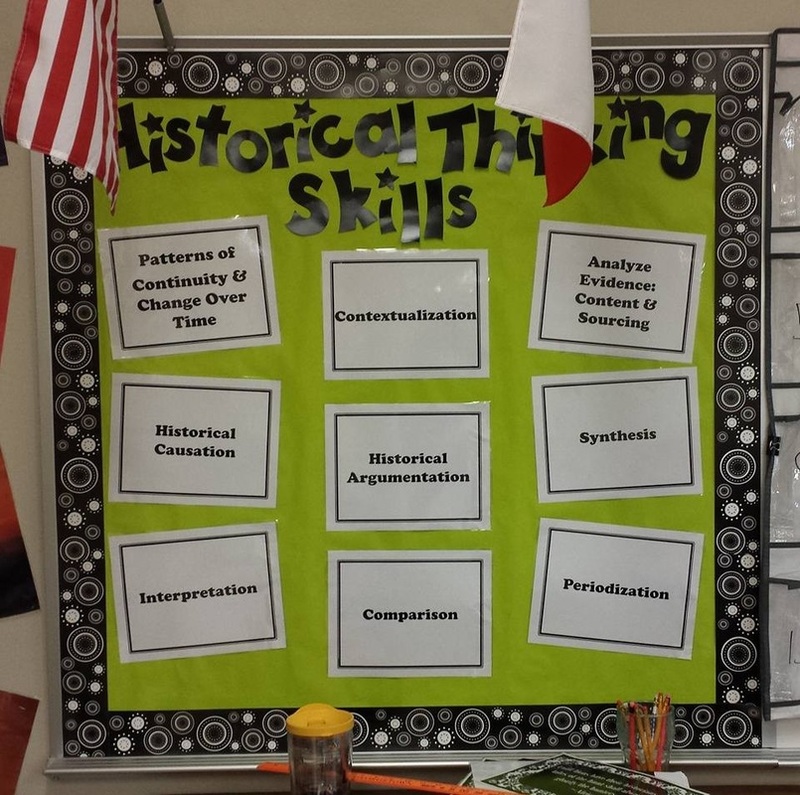 From the College Board: This section presents the historical thinking skills that students should develop in all AP history courses. 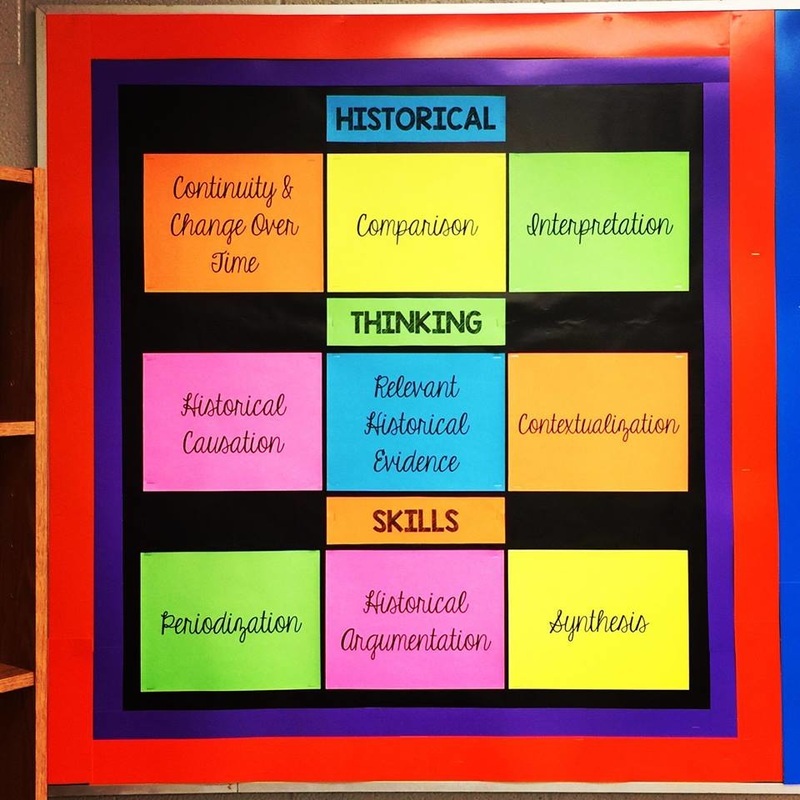 The nine historical thinking skills are grouped into four categories: Analyzing Sources and Evidence, Making Historical Connections, Chronological Reasoning, and Creating and Supporting a Historical Argument. Every AP Exam question will assess one or more of the skill-based proficiency expectations as well as one or more of the thematic learning objectives. Below is an introduction to each of the four categories and the nine historical thinking skills as per The College Board and with special credit given to Paul Sargent, AP Euro Teacher and AP Government teacher. Historical thinking involves the ability to describe, select, and evaluate relevant evidence about the past from diverse sources (including written documents, works of art, archaeological artifacts, oral traditions, and other primary sources) and draw conclusions about their relevance to different historical issues. Explain the relevance of the author's point of view, author's purpose, audience, format or medium, and/or historical context as well as the interaction among these features, to demonstrate understanding of the primary source. Evaluate the usefulness, reliability, and/or limitation of a primary source in answering particular historical questions. Historical thinking involves the ability to describe, select, and evaluate the different ways historians interpret the past. This includes understanding the various types of questions historians ask, as well as considering how the particular circumstances and contexts in which individual historians work and write shape their interpretations of past events and historical evidence. Analyze a historian's argument, explain how the argument has been supported through the analysis of relevant historical evidence, and evaluate the argument's effectiveness. Historical thinking involves the ability to connect historical events and processes to specific circumstances of time and place as well as broader regional, national, or global processes. Historical thinking involves the ability to identify, compare, and evaluate multiple perspectives on a given historical event in order to draw conclusions about that event. It also involves the ability to describe, compare, and evaluate multiple historical developments within one society, one or more developments across or between different societies, and in various chronological and geographical contexts. Compare diverse perspectives represented in primary and secondary sources in order to draw conclusions about one or more historical events. Compare different historical individuals, events, developments, and/or processes, analyzing both similarities and differences in order to draw historically valid conclusions. Comparisons can be made across different time periods, across different geographical locations, and between different historical events or developments within the same time period and/or geographical location. The College Board says the following about Synthesis: Historical thinking involves the ability to develop an understanding of the past by making meaningful and persuasive historical and/or cross-disciplinary connections between a given historical issue and other historical contexts, periods, themes, or disciplines. Make connections between a given historical issue and related developments in a different historical context, geographical area, period, or era, including the present. Make connections between different course themes and/or approaches to history (such as political, economic, social, cultural, or intellectual) for a given historical issue. Use insights from a different discipline or field of inquiry (such as economics, government and politics, art history, and anthropology) to better understand a given historical issue. Historical thinking involves the ability to identify, analyze, and evaluate the relationships among historical causes and effects, distinguishing between those that are long-term and proximate. Historical thinking also involves the ability to distinguish between causation and correlation, and an awareness of contingency, the way that historical events result from a complex variety of factors that come together in unpredictable ways and often have unanticipated consequences. Explain long and/or short-term causes of an historical event, development, or process. Evaluate the relative significance of different causes and/or effects on historical events or processes, distinguishing between causation and correlation and showing an awareness of historical contingency. Historical thinking involves the ability to recognize, analyze, and evaluate the dynamics of historical continuity and change over periods of time of varying lengths, as well as the ability to relate these patterns to larger historical processes or themes. Identify patterns of continuity and change over time and explain the significance of such patterns. Explain how patterns of continuity and change over time relate to larger historical processes or themes. Historical thinking involves the ability to describe, analyze, and evaluate different ways that historians divide history into discrete and definable periods. Historians construct and debate different, sometimes competing models of periodization; the choice of specific turning points or starting and ending dates might accord a higher value to one narrative, region, or group than to another. Explain the ways historical events and processes can be organized into discrete, different, and definable historical periods. Evaluate whether a particular event or date could or could not be a turning point between different, definable historical periods, when considered in terms of particular historical evidence. Analyze different and/or competing models of periodization. Historical thinking involves the ability to create an argument and support it using relevant historical evidence. Creating a historical argument includes defining and framing a question about the past and then formulating a claim or argument about that question, often in the form of a thesis. A persuasive historical argument requires a precise and defensible thesis or claim, supported by rigorous analysis of relevant and diverse historical evidence. The argument and evidence used should be framed around the application of a specific historical thinking skill (e.g., comparison, causation, patterns of continuity and change over time, or periodization). Furthermore, historical thinking involves the ability to examine multiple pieces of evidence in concert with each other, noting contradictions, corroborations, and other relationships among sources to develop and support an argument. Articulate a defensible claim about the past in the form of a clear and compelling thesis that evaluates the relative importance of multiple factors and recognizes disparate, diverse, or contradictory evidence or perspectives. Historical thinking involves the ability to examine multiple pieces of evidence in concert with each other, noting contradictions, corroborations, and other relationships among sources to develop and support an argument. Develop and support a historical argument, including in a written essay, through a close analysis of relevant and diverse historical evidence, framing the argument and evidence around the application of a specific historical thinking skill (e.g., comparison, causation, patterns of continuity and change over time, or periodization). Evaluate evidence to explain its relevance to a claim or thesis, providing clear and consistent links between the evidence and the arguments. Relate diverse historical evidence in a cohesive way to illustrate contradiction, corroboration, qualification, and other types of historical relationships in developing an argument.